I promised more Blissdom details and then I spent Monday at the eye doctor with the six year old (more on that later) and getting a tetanus shot at the health department, Tuesday at the violin shop and then realizing I'd come down with a fever and a nasty cough. But anyway, here's more as promised. 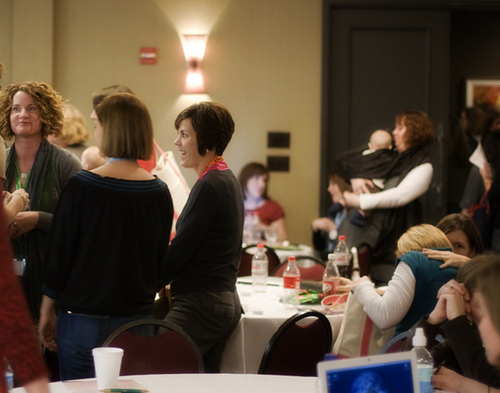 I may spend my days surrounded by very noisy children and even occasionally host a party of sixty homeschoolers, but that's nothing to being surrounded by 250 blogging women who were mostly strangers. It was overwhelming at times and I was glad to know a few people there already. The baby was extremely good both days of the conference. I've often said that she's a stronger believer in attachment parenting than I am and I think that spending almost two whole days in a sling cuddled up to her mama was fine with her -- although when I did put her down she would crawl off and start exploring. The swag bags were pretty awesome and included a coupon for a pair of crocs (something I've wanted to own for gardening for years and never have gotten). Alli and the One2One Network organized an amazing bunch of sponsors. I met more interesting women than I can possibly list (okay, I give up), but I will say I am constantly impressed by the number of really cool blogs that are out there. I know so many people with interesting, if quiet, lives in person, that it is only natural that the fraction of people who choose to share parts of their lives on the internet would make for some interesting reading. It's just too bad I can't possibly keep up with them all. I got to hang out a bit with the Nashville blogging contingent that I already knew Meredith, Michelle, Alli, Malia and probably some other people I'm forgetting and I also got to meet Nashville bloggers I didn't know like Amy, Brigid and Jessie. I went to Blissdom without really preparing well for it or having any idea what I wished to get out of it. In fact, I've been sorely tempted to give up the whole blogging thing of late. I am still not sure what I want from blogging, but I do believe I'm not quite ready to give up on it after all. Having picked up all sorts of interesting thoughts and ideas from the many amazing bloggers I met and listened to, I have some new ideas and possibly a few changes coming down the pike (assuming I can actually find the time and energy to implement them). If you want more details you can read lots of recaps here or you can just buy a transcript. Current being a completely relative term, because I think I was pregnant with my four year old when that photo was taken. I'm almost always on the wrong side of the camera and rarely like photos of me when one gets shot. It was very fun to have both real life and internet friends together in one room. Even if I couldn't hear half of what was being said. Obviously one can't say what YOU might get out of your blogging, but I get a great deal from your blogging. IRL our circumstances have isolated us from young families. We love following what you share about the joys and challenges and problems of rearing a young family, and we love hearing your views about the world: wise, funny, inspiring.